George Washington fired its men's basketball coach, Mike Lonergan, on Friday night, per a report from USA Today's Dan Wolken. As of Tuesday morning, sources told CBS Sports that George Washington's administration still had not informed the coaching staff and members of the team of Lonergan's dismissal, possibly due to ongoing negotations regarding Lonergan's buyout. Lonergan, 50, took over the Colonials program in 2011. Previously, he was the coach at the University of Vermont. Under Lonergan, George Washington won the NIT championship in March and he took the Colonials to the NCAA Tournament in 2014 and Vermont in 2010. 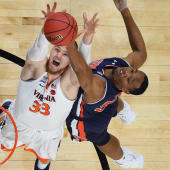 His dismissal comes after a revealing report by The Washington Post earlier this summer that detailed multiple allegations of "verbal and emotional abuse" by Lonergan to his former and current players. Allegedly, Lonergan also repeatedly made unseemly remarks about his own athletic director, an allegation at least five players reportedly corroborated. Lonergan was previously addressed by powers-that-be at the university, per the Washington Post, but the university never made any public statements or acknowledgement regarding concerns about Lonergan's alleged conduct and demeanor -- not until the Post's story prompted an independent investigation that began in late July. Multiple players and all of Lonergan's staff were interviewed on multiple occasions by an outside law firm (Saul Ewing), according to a source. In those interviews, some players confirmed disparaging comments Lonergan made about other players on the team, in addition to comments made about at least one opposing player. Per a source, one of the questions asked to GW players was if Lonergan referred to former Seton Hall guard Derrick Gordon as "the gay kid." Players confirmed that had happened. Gordon broke barriers in 2014 by becoming the first active men's college basketball player to openly declare his homosexuality. George Washington played Seton Hall last season, Gordon's graduate year with SHU. The outside investigation included interviews with multiple staffers in the athletic department, as well. George Washington's men's basketball team took a trip to Japan in August. After returning, interviews continued. In the past three weeks, the investigation uncovered new information, allegations not included in the Post's story, a source said. Things escalated quickly on Friday. One source told CBS Sports that Lonergan was escorted off campus. The staff was informed in the late afternoon that Lonergan would not be attending a Friday night dinner with a recruit, who was on his official visit. When the story broke late Friday night, the staff and players were still not informed by anyone from George Washington about Lonergan's fate. Lonergan's career coaching record at the Division I level is 223-138. A native of the greater D.C. area, he led GW to an NIT title this past April. He also saw at least three players transfer out of the program each of the past four seasons. Some of those transfer decisions were a direct result of Lonergan's behavior. "I don't think what he said should be tolerated," one former unidentified GW player told the Post. "I would like to stay at GW. I will not play for Mike Lonergan." A source told CBS Sports that investigators asked players if they would be upset if Lonergan were fired. Many former players opted not to talk to investigators. George Washington's season will begin Nov. 11 at home against Maryland-Eastern Shore.